News, gifs & production updates! Hey guys! It’s time for another news post! Please excuse the gaps between updates—for this past couple of months we’ve given full priority to working on the game. In order to maintain focus, we’ll keep on doing updates this way for now, but rest assured we’re steadily working on the project. If you celebrate Thanksgiving, hope you’ve had a great time with your loved ones! So what has happened since the last update? A lot! Jonathan, Miguel, Fran and I have been developing new content for the game.Mathias and Looki (the guys in charge of porting) have also been doing a fantastic job porting the game to C++, after which we’ll be able to fully port the game to other platforms & consoles. Other than that, Lee has continued to make amazing hi-res character portraits (which will be featured in the Talebook!). The two characters below are Ange and Remis. Remis is a professor Alicia meets down in the Old World, who’s trying to prevent war from breaking out in the Valley. He and Ange will help Alicia go back home. The team has continue to grow in size over these past months! Our newest addition is the talented video game veteran Henk Nieborg, whose graphical work you might know from franchises like Shantae, Contra 4, Spyro, The Adventures of Lomax, and Harry Potter & the Chamber of Secrets (GBA). He’ll be helping us create beautiful new environments for HFA’s game world. Now that there are quite a number of people involved with the game, the dynamics of development have become very different from how I used to work before the campaign. Leading a team is a fantastic opportunity to coordinate everyone’s talents to produce the best game we can make. This implicates giving a lot of creative feedback and direction, which is unfortunately a job only I can do and requires dedication on my part. I’ve always been okay with wearing many hats, so I’ve split up my time between all the tasks that need to be done and we’ve carried on moving ahead, even if it’s a bit less quickly. We’ve also been concentrated on restructuring some older content to be more fun and engaging. This includes redesigning parts of some earlier dungeons, doing some polishing on enemy behavior & animations, re-considering room structure and level design, etc. The part of the game that most needed a re-haul was the introduction of the game. It used to be the oldest content in the game, and some aspects of storytelling just weren’t as interesting as they could be. Since this’ll be the first impression you guys get from playing the game, I had to make sure it was the best we could give you. Also, this new introduction will give players a good taste of how the rest of the game will play. There’s a lot more action now, each NPC character and enemy has more frames of animation, there are new rooms, extended sections, and a couple of new memorable events in the introduction that establish the tone of the story. Character dialogue is something that got a lot of attention as well, and there’s a lot of subtext for you to pick up on & read between lines. Below you can see Alicia treading up the Hill during her Trial, featuring the new widescreen ratio! This is not to say you have to sit through all of cutscenes. I’ve cut things down as much as I could, and you can always skip a cutscene if you just want to jump into the game (although you’ll miss all those pretty custom animations!). If you’re more the type that likes to take their time to digest the world and story, though, you can always find out more about what’s happening. And if you’re the curious type, there are few well-hidden secrets in Brenia for you to find—some of which will *ahem*let you get an ultimate spell later down the line*ahem*. For this past couple of weeks I’ve been working on a particular dungeon called Bottomrock (pictured below), which lies to the East of Brenia. In here, Alicia will meet a robed man with a silver mask who might be a Spirit in disguise. Bottomrock wasn’t exactly a dungeon before, as it used to be a lot shorter and smaller. However, I realized we had to expand it to give the players a nice introduction to the game’s movement & fighting mechanics, and give them enough time to master them. We created a few new enemies for this place, as well as several rooms. This dungeon also turned out to be a good place to present some cool puzzle situations with Buttons™, Crates™ and Rising Platforms™! We recently modified a bit how Alicia casts magic: now it’s instantaneous! A few months ago I showed the game inside a local venue, and got a chance to gather some feedback from people who got to play parts of the game. I noticed from their reactions & feedback that using magic spells felt sluggish and needed a bit of tweaking. There used to be a small delay when Alicia casted spells (see above), during which you lost control of your character until the spell was cast. The original reasoning was that, because spells were a lot more powerful than the whip, there had to be a delay to balance them out. Because of this delay, though, I was teaching the players that magic was only good for specific situations. Thus, players often chose to fight with the whip alone, which is definitely not suited for all situations, instead of a combination of magic & the whip. Thus, I decided to place the cast delay afterwards in the form of a cool-down, which is displayed as a tiny green counter behind you (see below). All spells are cast instantly, and almost all can be cast whilst in the air—just like the whip—, and you never lose control of your character. It’s a very tiny modification, but it makes a world of difference in terms of responsiveness and usefulness. The cool-down length is determined by each magic spell, and can be shortened via a new stat called “MSPD” (magic speed). We’ve also added a bunch of smaller details like giving Alicia a bunch of extra animations to make her appear as fluid as possible, we corrected the blasphemy of not having chests (which give away coins, items and other goodies). We also implemented resizable text-boxes to steal as little real-estate from the screen with every line of dialogue, and added extra visual effects with combat to make it look more stylized and impactful. Out total amount including PayPal pledges is at $238,079 right now, just a little under $7,000 short of the 3DS goal. Like I mentioned in an earlier post, pledges usually slow down after a campaign ends, but that didn’t stop us from preparing the game and working with its resources to stay within the limits of the 3DS console for when we begin working on a port (we even adopted its widescreen resolution, 400×240, and have implemented features to handle 3d parallaxing projection). We’re crossing our fingers so that we’re able to reach the goal once we start making more marketing noise for the game next year. We’ll open up $5 add-ons for the 3DS once that happens. However, if we don’t get to the stretch goal before the game’s release, as a last measure, we’ll get take it to 3DS a little after launch with release funding. 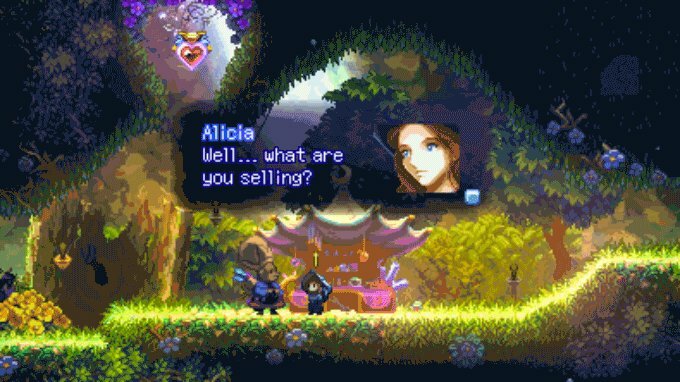 We definitely want to bring Heart Forth, Alicia to that console. For those of you concerned about the surveys and specifying the $5 add-on console keys you added during the campaign, don’t worry. Once we’re ready to hand out console keys, we will present you guys with a system that’ll let you make final decisions on the console ports you want. It’s important that we do have all surveys answered, so if you haven’t filled yours out yet, please do so when you find some time! Also, feel free to get in touch with us via private message if you have any problems. Like I mentioned when the campaign closed, we never expected for the project to grow like it did. We came to the expected May release date back when we were preparing the Kickstarter, thinking the project’s scope was going to stay relatively the same towards the end of the campaign. Lucky for us, you were really supportive and generous, and helped make the project grow like I never imagined, giving us the opportunity to really make something special. However, with this growth also came a great deal of responsibility to deliver a quality game worthy of your support. We definitely don’t want to rush the game, or cut it short, and compromise the quality of your experience. For that reason, the launch date of the game might slip back a little later in 2015. Though I understand potential delays might disappoint some of you, hopefully you’ll agree that it’s for the sake of releasing a great final product. Rest assured that we’re all working as hard as possible to bring you the best and most polished, hand-crafted journey we can make, and I’ve only to thank you guys for helping me take this dream project where it needs to go. Any news on the Alpha Demo that was to be released for the $50+ backers on Kickstarter? Is that being delayed as well? The Alpha demo is still some time away from release; we’ll let you guys know once we’re getting closer to sending it out. My wife and I are so excited for this game! Don’t worry about moving the release date back. Quality is the priority! I think for most (If not all) people when I say, I would rather a game come out late over it come out “on-time” and it not be complete… or not come out at all. XD Make sure to have fun with the production though, otherwise the project would be kinda pointless! Man, I am so excited about this game! I cant wait to buy it! @DaJoe Yes! You’ll be able to buy the game through Steam once it’s released. People are going to complain either way, if you release the game quickly they’ll say the game is unfinished or too buggy and if you take your time to make exactly what you want you’ll still never finish or at least not fully flesh out all of you good ideas. So why not get the bugs out, polish, release, accept feedback… and enhanced edition?, expansion pack/ DLC. Just my opinion, sorry if this is not helpful or you’ve heard it before. Would you accept a suggestion? About the cooldown spell indicator. It´s kind of ugly (lol, please, don’t mind my manners) and obtrusive. Could you guys make something more subtle? Like a focus effect, a white light/line with the character silhoutete that contracts around herself than blinks/fades/pop/whatever when her body is touched, meaning that she regained her strengths to cast it again? That would really shine instead of that green clock. This game already looks like becoming one of my favorite games. But one thing: be VERY careful about setting the difficulty level right. I mean not too easy. Many new games today have the tendency of being just plain easy and that’s what can very easily damage even the best masterpieces. 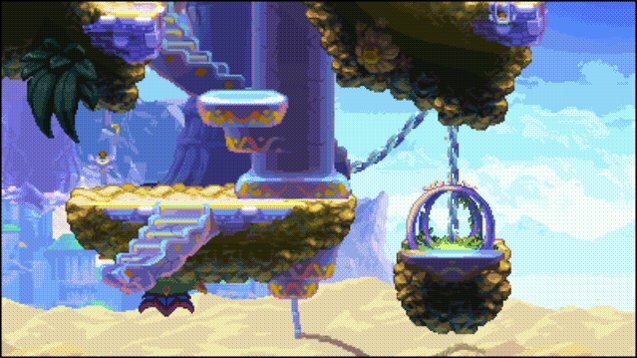 For example, Dust: An Elysian Tail was otherwise really good, but really easy to play through. In that game, It was like trying to go fast forward and avoid grinding to not get over leveled. There should be a reason getting some level and have effort in getting new equipment: to make it possible to get through a difficult part. Another pitfall for new games is that there is no fear in dying, I mean the game is saved all the time and when you die, you can resume from a situation 20 seconds ago. So there’s no penalty for it. And there is no feeling that you have survived a long and difficult part. Please seriously consider these things, they are one of the most important things in the game. I can’t wait to rock this on PC and 3DS. I haven’t been this excited for a game in years. Great game, alonso :-) Demo was brilliant. and haters who hate the graphics, meh them. The pixelart is sweet and animations are great. Full support, cant wait for full release. You did smart move that you didnt show the stuff out during all the years.